If you’re expecting the new BEN-HUR film to be underwhelming, you won’t be disappointed. With the exception of the iconic chariot scene, this new version lacks everything that made the 1959 version starring Charlton Heston the epic classic that it is. Produced by the same couple who brought us SON OF G-D a few years back, reality TV show creator Mark Burnett and his wife Roma Downey, BEN-HUR (2016) reinterprets General Lew Wallace’s sweeping 1880 novel, highlighting the notion of “forgiveness” rather than the notion of “revenge”, which was the predominant theme in the 1959 film. The Burnetts may have been hoping for a miracle when they brought Kazakh-born Timur Bekmambetov on board to direct. The man, whose resume features ABRAHAM LINCOLN: VAMPIRE SLAYER as a high point in his career to date, is woefully unqualified to take on a film that has such legend attached to it. With the exception of Morgan Freeman who plays Ilderim, an African-Arabian sheik who makes his living competing in and betting on chariot races, the film stars a cavalcade of either unknown or little known actors. Judah is played by Jack Huston (grandson of legendary director and actor John Huston) in what may just be his biggest role yet. He has appeared in quite a few successful movies of late, including HAIL, CAESAR! and AMERICAN HUSTLE, but in roles that went unnoticed by most people. Messala is played by Toby Kebbell, who has a similar looking resume. Other actors include Rodrigo Santoro (THE 33) as Jesus, Nazanin Boniadi (TV’s HOMELAND) as Esther (who marries Judah early on in the story), Ayelet Zurer (FUGITIVE PIECES) as Judah’s mother, Naomi, and Sofia Black-D’Elia as Judah’s sister, Tirzah. In this new film, Messala and Tirzah have a thing going but Naomi is not about to let her Jewish Judaean Princess marry a polytheistic, idol worshipping Roman, even if he is Judah’s best friend and the family’s adopted son. Miffed at his station in life, Messala decides to join the Roman Legion and head off to far flung places to expand the Empire. Successful in battle, he comes back to Jerusalem three years later as the prefect to Pontius Pilate. When a Jewish zealot attempts to assassinate Pilate, Messala holds Judah responsible, sending him to the galleys. There, Judah rows for five years until a naval battle against the Greeks on the Ionian Sea goes badly for the Romans and he is able to get away. He ends up floating to shore where he’s rescued by Sheik Ilderim who sees his potential as a chariot driver to make money off the Romans. Judah, however, just wants revenge on the man who destroyed his life and his family. Ilderim, though, convinces him that the best way Judah can get back at Messala is by beating him at the Circus Maximus and taking away his pride. As Ilderim (and the film’s tagline) says, the first to finish is the last to die. Clocking in at just over two hours, BEN-HUR (2016) is considerably and mercifully shorter than the 1959 film, which was 3 hours and 42 minutes long (including the wonderful 6-1/2 minute long overture and 3-1/2 minute long entr’acte by Oscar® winning composer Miklos Rozsa). However, just getting to the point where Judah is sent to the galleys takes up almost half the film’s running time. As a result, the rest of the film seems very rushed. The scenes where Jesus is arrested by the Romans, his journey along the Via Dolorosa and his crucifixion takes up just a few minutes. In an effort to cram everything into two hours, there are too many short scenes. If you suffer from ADD, this is a great film for you. Other problems abound in this version. To start, these actors are all lightweights. Jack Huston is no Charlton Heston. There’s no machismo and no bravado. This Judah is too soft and cuddly to have endured five years in the hull of a ship. As for that ship, we see the war at sea level, mostly through the eyes of the galley slaves. This was an interesting directorial choice that might have been more impactful had we been given more than the occasional aerial perspective. 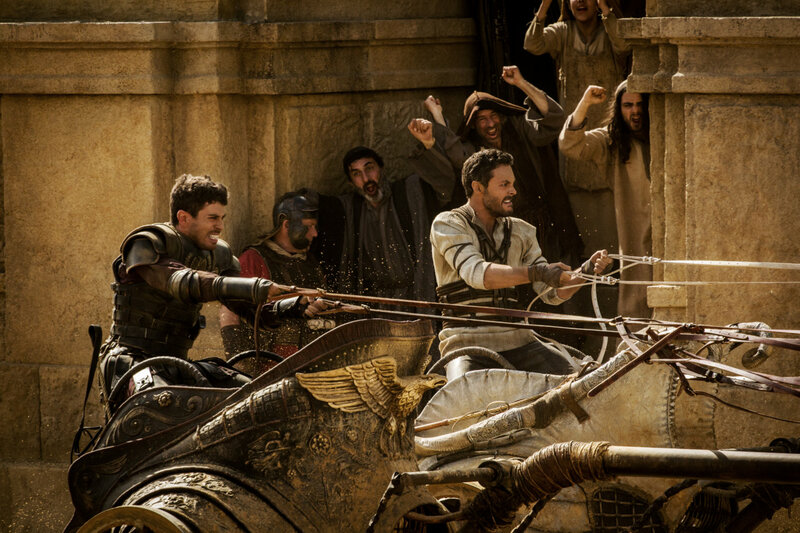 The same can be said with the chariot race, which is the film’s centrepiece. It has too many close ups and mid-range shots, and not enough wide angle shots so that we can appreciate the spectacle. It has tension and excitement but to nowhere near the same degree as in the 1959 version. Perhaps the greatest head-scratching moment, though, is saved for the very end of the film. As the closing credits roll, R&B singer Andra Day croons “The Only Way Out”, which makes no sense at all. Fortunately for audiences, there is a way out. It’s called the Exit door and my advice is to run there as fast as you can. Do yourself a favour and rent or buy yourself a copy of the 1959 version. There’s a reason why no other film has won more Oscars®.